Many claim that control of Tiananmen Square in China represents control of all China. It is the middle of the "Middle Kingdom". 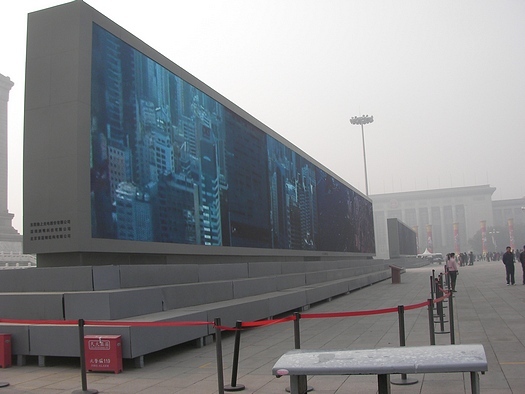 Below you see public domain pictures of this heart of China, including the coolest, outdoor, giant video display you've ever seen! 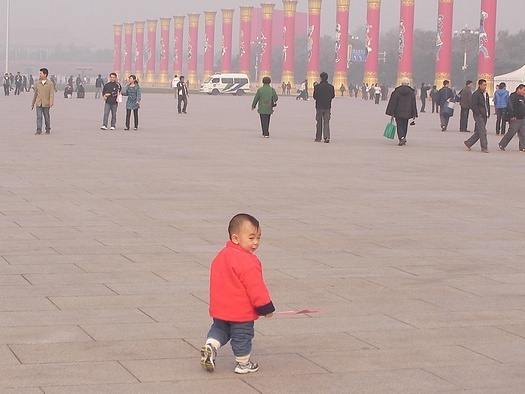 The pictures here show Tiananmen Square as it was soon after China's October 1, 2009 celebration of the 60th anniversary of the founding of the People's Republic of China. Bordering Tiananmen Square on the north is the huge gate to the Forbidden City (former palace of the emperors, now open to any commoner with the price of admission). Just east of Tiananmen Square, China has its Chinese National Museum. On the West is the Great Hall of the People. 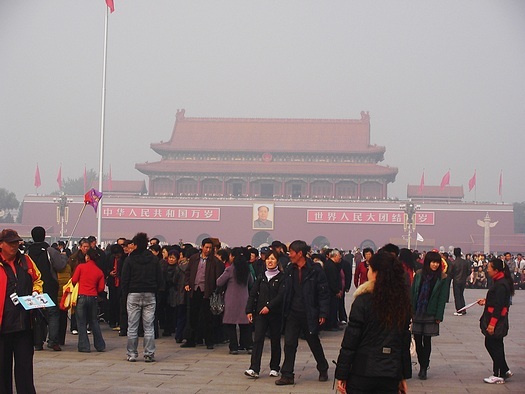 In the centre is Mao's Tomb. If there's one place that represents all of China, it's got to be Tiananmen Square. I've heard people in the West say it is generally accepted that whoever controls Tiananmen Square is acknowledged as controlling China. Certainly the Chinese government acts like that were true. For instance, October 1, 2009 was the 60th anniversary of the founding of the People's Republic of China. Where was the huge celebration? The parade was on the street that passes between Tiananmen Square and the Forbidden City. 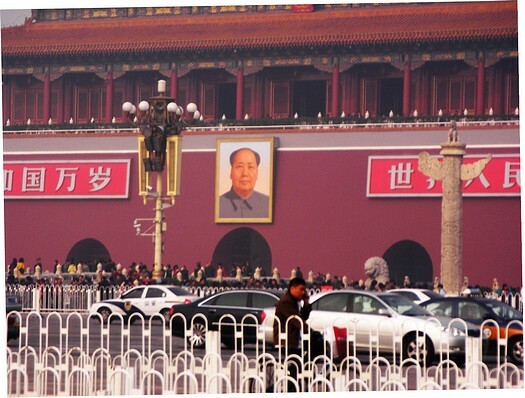 The highest officials stood on that huge gate where they, like Chairman Mao's giant portrait, overlooked Tiananmen. See those red bars in the picture above? Those are video screens. By the way, you might be wondering why it looks so foggy. That's not fog; it's smog. This, unfortunately, is a normal Beijing day. There are very few clear days. 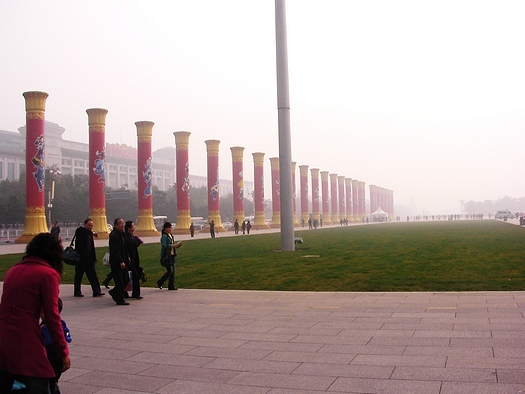 Typically you cannot see clearly from end to end at Tiananmen Square. China is concerned about this, but exactly what to do about it is debatable. How much should economic progress be slowed down to protect the environment? But, you ask, why was the air so clear for the 2008 Olympics? Because they shut the factories down. That was worth the economic cost to gain international prestige. Anyway, back to the video screens. Here's a closer look at one of them. These things are immense. They were set up for the National Day celebrations (October 1) and were still up when I visited in November 2009. Unfortunately, the screens will not stay forever - they've probably already been removed. A few minutes after I entered the square, these screens started showing a fantastic video tour of China with musical background. It was not only beautiful but also truly impressive, particularly when you think how big it looks then realize how far away you are from the screen! FYI: These are not the biggest video screens in the world. The record, as far as I know, is held by a stadium in Texas (where else?). It's about as wide as one of these two screens but three or four times as tall. Click here for information about the largest video screen in the world. The Chinese name for China is "Zhong Guo". "Zhong" means "middle" or "centre". "Guo" means "kingdom" or "country". If you've heard China called the "Middle Kingdom", that's why - it's one direct translation of the Chinese words. But where is the middle of the middle? Although at various times in China's history the capital city has changed location, modern Chinese people here have no doubt that Beijing is boss, and smack in the centre of Beijing is the Forbidden City and Tiananmen Square, China's heart. In the spring of 2010 I asked a couple of Chinese university students what Tiananmen Square meant to them. To them, it was just an interesting historical place. These two had been to Beijing before but hadn't bothered to go to Tiananmen. Their attitude was "Sure, it's historical and kind of interesting, but so are many other places." These young men were concentrating on their fast track to success, and viewing Tiananmen was low on their priority list. 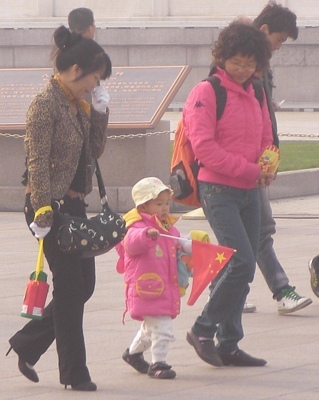 On the other hand, the Chinese people I have seen in Tiananmen Square China seem tickled pink to be there. The enthusiasm is really quite infectious! At this time of the year, past the summer tourist season, the tourists are mainly in tour groups from other parts of China and they love it! Return from Tiananmen Square, China to Chinese Places overview page.